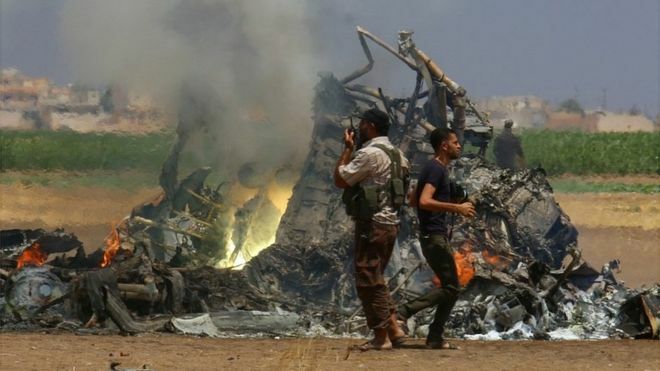 A Russian helicopter has been shot down by rebels in Syria’s northern Idlib province, Russian officials say. The helicopter was returning from delivering humanitarian aid to the city of Aleppo, Russia’s Interfax news agency quoted officials as saying. Russia has previously, though seldom, lost aircraft since it launched operations in support of the Syrian government at the end of September 2016. In July, two Russian pilots were killed when their helicopter was shot down east of the city of Palmyra by so-called Islamic State (IS). Pictures on social media purportedly of the latest Russian helicopter to be brought down showed burning wreckage and bodies, with armed men milling around.